This one comes as an innovation from the faculty of the Institute for Dynamic Systems and Control at ETH Zurich. They are teaching ‘Distributed computation algorithms’ which is a pretty dry discipline. The faculty came up with a better way of teaching the subject rather than using the sets and lengthy exam which is indeed the conventional method. They encouraged students into developing robots which would work on these principles. 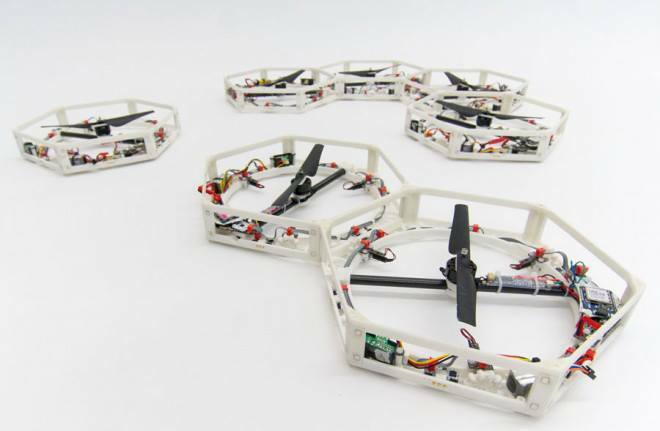 The result of this unique approach is Distributed Flight Array (DFA). 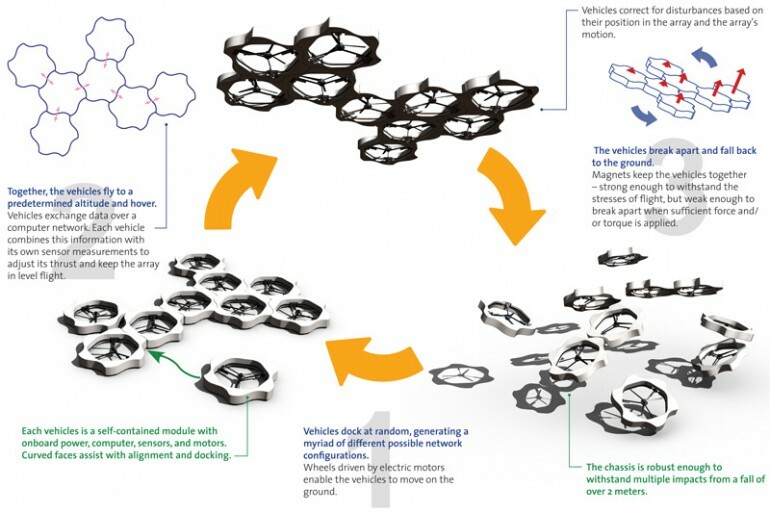 This DFA is a transformer, prototype of course, which allows a number of self-directed robots to assemble with one another into a bigger robot and take flight while providing a platform for experimentation. The ultimate goal would be to remove even the tiniest bit of human touch in this robotic platform. These DFA bots have a 3D printed chassis and there’s more to them than what meets the eye. They are small yet packed full of surprises. The whole system has been designed with a propeller which enjoys the central position. This propeller provides the system with the thrust for the take off. 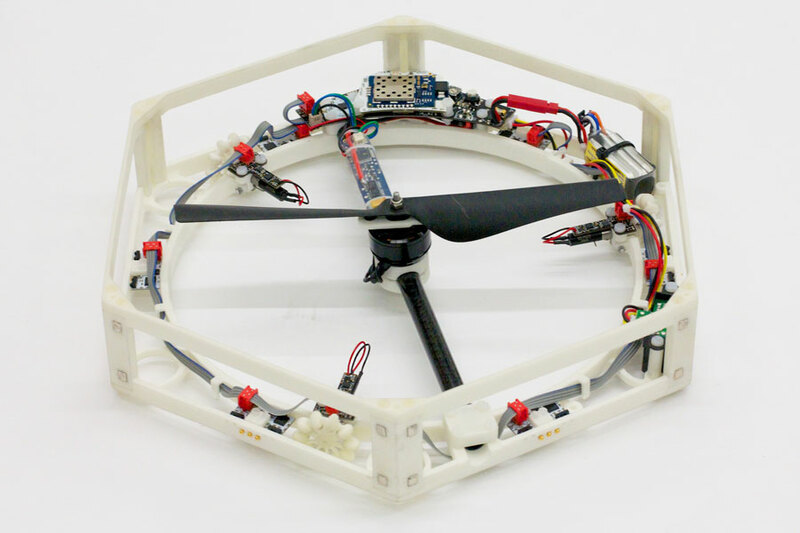 Three omni-directional wheels surround the propeller which allows the DFA bots to get into position while they are on the ground. Then we have magnets that have been embedded into the frame for the sake of connection. 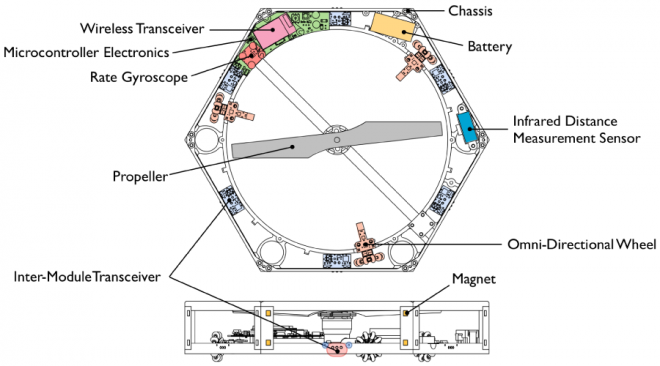 Moving on, there is a gyroscope which helps provide the information related to position to the microprocessor which is mounted onboard. The last but crucial piece is the infrared sensor which works in real-time to help them maintain their individual thrusts in order to keep the combined unit stable. Quite a sensitive package, yet at the end of a flight, these robots disengage from one another in mid-air and fall safely on the ground. United we stand, divided we fall! This is the rule here too; the bots alone can only move around spastically in the room but join them together and you have a traditional quad-copter which is more advanced. They can simulate typical and asymmetrical arrays which basically defy the conventional aeronautics aesthetics! These combinations, although odd, sometime produce quite fascinating flight patterns which are interesting to watch. The sad news is that we might not see a commercial use of these DFA bots, as in words of Dr. Oung; ‘Honestly, I don’t see a mainstream commercial opportunity here.’ However, let’s not kill our hope of this becoming an open source project one day! It is really a wonderful for me.